Provides a permanent, protective matte or gloss coating which protects art, crafts and valuables against harmful UV light rays. Protects against fading, moisture resistant and smudge proof. 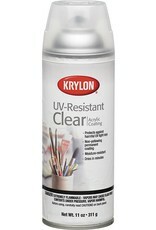 Use to protect photography, watercolor, fabric, display materials, pencil, charcoal, florals and more.